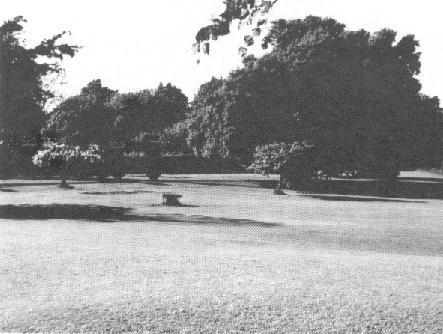 A Pictorial History of the Manor Grounds. Sold by the original Lloyd family to Lancing College in 1920 for Boarding pupils. Sold in 1935 to Worthing Council, who by 1972 decided to demolish it so that a leisure centre could be built ! 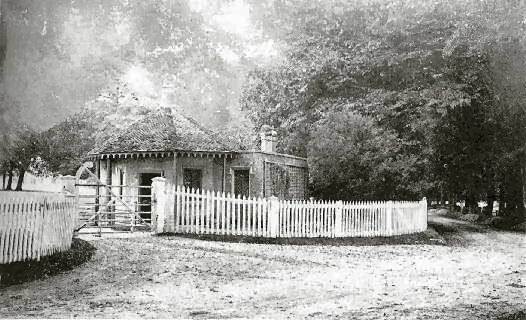 This was the Manor Lodge (gatehouse) in 1910. Situated on the north side of the 'roundabout' of the Old Shoreham Road and Grinstead Lane. The road on the right of the white fence was widened and ultimately became the A27. 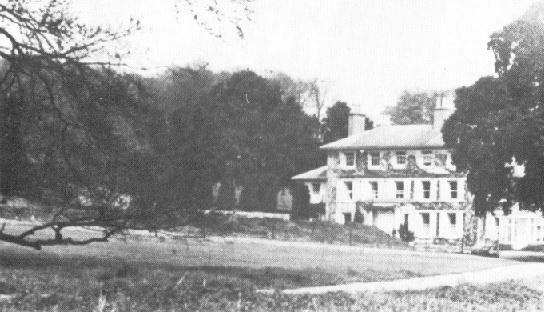 The road to the left corner of the picture was/is Manor Road...the lodge ?..demolished in the 1930's. in the picture were destroyed by Dutch Elm disease and the 'great'storm of 1987. 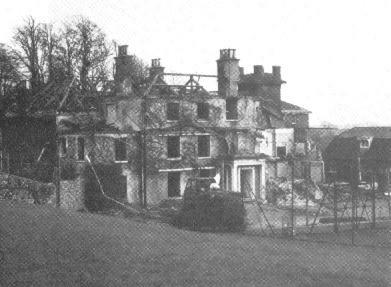 Eastern side of the Manor House in 1950. Looking North West around 1950. 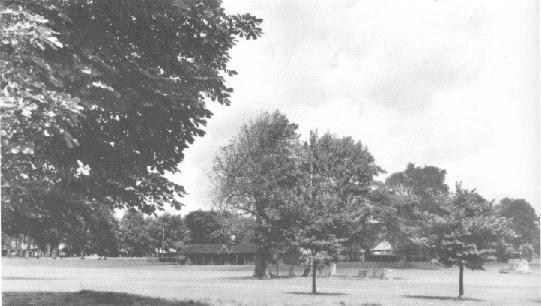 The old Pavilion can be seen in the distance. Again, most of the trees are long gone. A fantastic new picture that has just come into our possession in late 2011 of the Lancing Manor Ground in the late 1950's. The Navy/Sky Blue/White flag of WOG is clearly bereft of wind. The Manor House looks splendid in the background. The Pavillion looks grand too - shame the Bowls club only let the cricketers use the West 'end' for storage - the rest they had. Perhaps a twisted smile of the cricketers when it was burnt down some years' later. 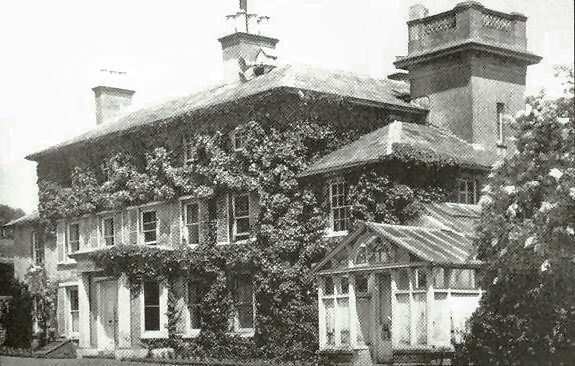 Another view of the Manor House around 1950. Looking North East from the southern part of the Manor Grounds. 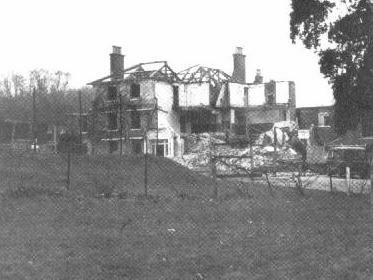 1972...Manor House surrounded by fencing, being demolished ! From it's earliest incarnation to the present time - Lancing Manor Cricket Club has , like many clubs of a similar size , gone through varying levels of success , on and off the field. 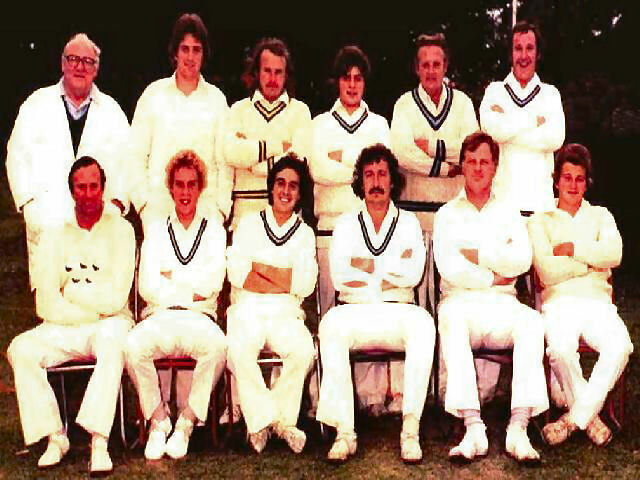 The origins of the current club go back to 1922 – Worthing Old Grammarian’s Cricket Club was formed alongside the Football Club of the same name. They were invited to merge with Worthing Cricket Club for the 1923 season only to find themselves the principle team as Worthing CC had lost access to their own ground and therefore Worthing ‘A’ CC as it was now called became the only ‘Worthing’ team. 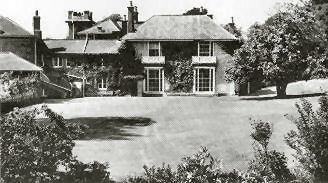 With Worthing CC re-starting at their present home in Broadwater in 1927 the two clubs merged fully – with some of the committee of Worthing ‘A’ moving to the committee of Worthing CC. This ended chapter one of the WOG Cricket Club as it was known. In 1931 a one-off cricket match organized by the continuing football club was played – this perhaps sowed the seed for the reformation in 1934 when a handful of matches were played under the WOG CC name. From 1935 onwards WOG played a full summers’ fixture list right up of course until WW2, matches were played through most of 1940 before fixtures were cancelled and some players moved to Findon to provide play. The summer of 1946 came too soon to organise matches, but this allowed time to prepare the club to hit the ground running fully in 1947. Playing at various grounds around Worthing – Broadwater Green, Hillbarn, Rotary, Victoria Ground, Homefield Park and Northbrook Park, they scouted round and found a piece of land that they obtained a short lease on, Forest Road. This was to be a joint home with the football club and between them they set up (it was said) a splendid site for sport. The wicket wasn’t ready until 1951 but finally WOG had a full time home. They had planned to extend the lease when Worthing Council planned to build a school with the Football and Cricket Club’s playing effectively on the playing field of the school. This plan was destroyed by the council deciding they were going to build a housing estate instead of the school. This meant WOG CC had to either go back to wandering around Worthing Council pitches or ground share. As luck would have it though, Lancing Manor CC had been evicted from the Lancing Manor ground for failing to maintain the wicket - Press reports in the Worthing Herald of 31/5/1957 stated much conflict and stubborness from both LMCC members and Worthing Rural Council who simply deemed the other to be responsible. I guess in hindsight it was a fight LMCC were unlikely to win. The summer of 1957 saw no cricket at the Manor Ground, with Lancing Athletic CC and Sompting CC members no doubt chuckling to themselves at the sudden influx of 'Manor members' wishing to play for them! WOG applied to play at the Manor Ground for 1958. Other applicants were considered, including the previously evicted LMCC but the WOG reputation in the area for maintaining a quality wicket and 'social club' won them the vote. WOG CC had a new home. 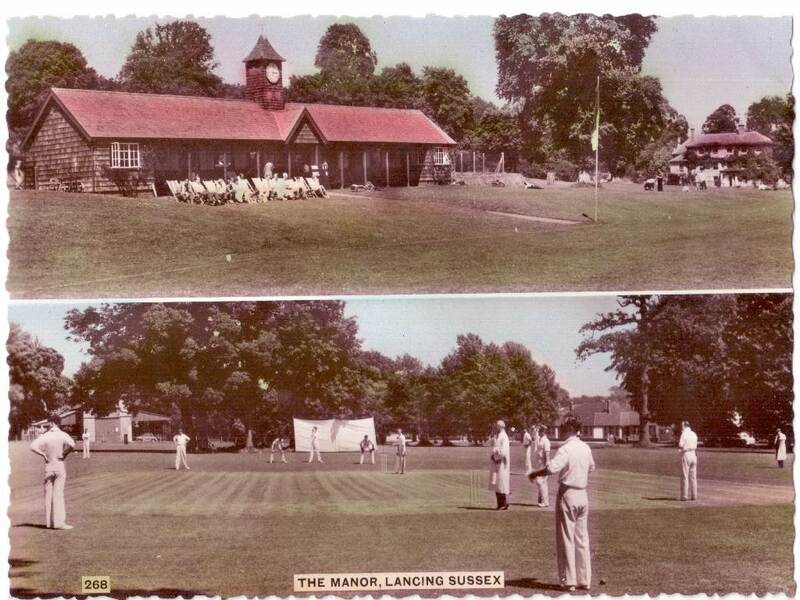 So after Lancing CC (1850-1925 and 1937-39), Sompting CC (1946-51), Lancing Athletic CC (1946-51) and Lancing Manor CC (1952-56) there was another new club calling Manor it's home. Thankfully this club has remained to this day. Through those 'wondering' years and the 'Forest Road' years the club had a number of players who were the backbone of the team for 20+ years - Frank Allen and Harry Foinette took around a 1,000 wickets between them and Dave Rickard had over 60 hauls of 5 wickets in his 750 wicket total - he also had over 20 plus scores of over 50 including a long-standing record 146no being the top score. The averages as match reports do not cover every match though, so the outstanding performances only give some perspective of how good these players were. It may well have been a time when every club had bowlers taking wickets at <7 or 8 runs, but there were enough batsmen around averaging over 20 to show that it wasn't always a steady procession. It is however a time when nearly all the best bowling performances are seen and also when most of the low scores are seen. In the autumn of 2011 an oil painting from 1958 was donated to the club by a local firm of Solicitors, by the artist John Adams, it depicts a match with the WOG flag (Navy/White/Sky Blue) flying as well as distinctive Caps of roundels of the same colours for the home team players. The scene itself is great to see how different the ground looked - although the 'within boundary' trees are positioned at wide mid-off (and mid-on from other end) rather than behind the bowler due to the square and wicket being some 30 yards further down the hill (prior to the widening of the A27). Through some years of the 1960's the square/wicket was played North/South, but by the late '60's was back to East/West. 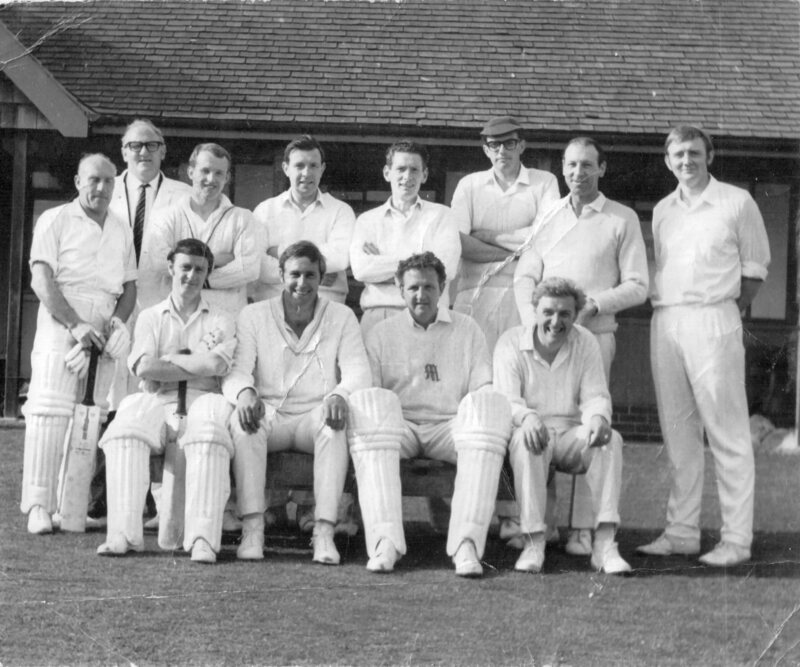 In February 1965 it had been voted to change the name to 'Manor Cricket Club' - especially as the 'Old Grammarians' tag didn't necessarily associate with the majority of members as there were few of the old pupils still connected with the club and many Lancing residents and players from other clubs had joined anyway over the previous half-dozen years or so. Effectively though it was a re-naming of an evolving club - the Committee and the 'stars' of the team had remained through the changes. The club would actually re-name itself again, back to 'Lancing Manor Cricket Club' for the summer of 1971. A handful of players were certainly prominent in the early/mid-60's - Ray Knight (6'4 opening bowler) averaged around 7 runs per wicket and when he left for Goring CC in 63', Ex-Worthing player Tony Watts (100 wickets as skipper in 1965 at 6.8 each!) and Neil Hewitt who most weeks were taking anything between 3 & 5 wickets per game with the more than occasional 6,7,8 wicket haul thrown in too, took over. Tom Dix's 9-15 in 1959 remains the 2nd best figures ever and Gerry Dawson (skipper for 66/67) had many spells of 6&7 and even had a 9-for. If the the full figures were available these four bowlers they would rival Russell Wood and John Coles as best bowlers the club has ever had. During the 1960's it was certainly a bowlers paradise wherever the games were being played. Score around 150 would win 9/10 matches and regular scores of <50 were seen. It goes without saying that very few 100's were scored and perhaps only 1/3 matches saw a 'Manor' half-century scored. The club would be so different 30+ years later when it'd be perhaps once a month that a bowler obtained a 'five-for' whilst 50's+ would be seen virtually every innings. The cricket square itself - which of course had a major say in the creation of the club as we now know it - was up always East/West - apart from 3 matches at the end of 1956 when the experiment of North/South saw the ball flying head-high and in 3 matches 1,100 runs were scored for the loss of 14 wickets. It went back to E/W until 1959 when the N/S came in again and stayed that way until the end of the 1968 season. With the widening of the A27 and the creation of the Manor Roundabout, a fair chunk of the outfield was lost and the move back to East/West was back in, to remain to this day. The artificual wicket - which greatly reduced bowlers figures(!) was installed in 1984. Therefore the last quarter century has not seen a grass wicket/square and the possibilities of that remain remote unless there is a significant change of thought from the Council. Unfortunately, as seen in the pictures above, the Manor House itself has sadly been replaced by a Leisure Centre....and the old Pavillion (an old Train Carriage !) was 'burnt down' at more or less the same point in time, in the early 70's. Some of the character of the ground still remains...especially in the form of the Eleven oak trees within the playing area !! The nucleus of the early years were players who would form the backbone of the team for the next decade . People like Captain Mike Reynolds (6000+ runs) , John Lane (4000+ runs 500+ wkts), John Ray (3000+ runs 300+ wkts) , Bill Winter (3500+ runs 1100+ wkts) , Dave Wood (11000+ runs), Ted Poole (3000+ runs) and Russell Wood (876 wickets @ 10.7 !!) would all play in excess of 300 matches for the club , and in Bill Winter and Dave Wood over 1500 matches between them !! - all of whom were not only very good club cricketers , but the type of player every club needs - those that would get involved with the jobs everyone hates...team secretary/fixture secretary/treasurer/pitch and pavillion maintenance. Throughout these early seasons matches were friendlies. Although technically friendlies , many matches showed the way local club cricket was to follow- into a league structure. Many matches in the 60's and 70's showed 'making a game of it' didn't really come into play. Maybe the lure of the pub was the reason why every other weekend a match was finished before tea !! - Manor's 14 all out lasted roughly 45 minutes ! During the late 70's one local resident (he lived a six hit due south of the ground) joined the club and would make a lasting impression, not least on removing many long-standing 1st XI players by replacing them with talented colts. That man was Les Lenham the well respected coach and ex-Sussex County Cricket Club Player. Bringing his first class experience and considerable coaching abilities he turned LMCC into a reasonable force ..at club level ! - not withstanding his own contribution , 4341 runs @ 68.9 and 191 wickets @ 10.4 in over 100 matches including the club top score of 178 not out (made out of 200-3 !!) , his presence also helped the developement of colts such as :- Roger Geal , Chris Prees , Nick Bazen , Martin Gander , Paul Thurston and most significantly John Coles , a tall fast bowler of superb control who would play for the Sussex 2nd XI and is generally thought of as one of the best local bowlers of the last 20 years. Les Lenham also introduced his young son Neil Lenham to the club - he would play 53 matches (scoring 3 100's and 3 50's before he was 14 !! ) in his 4 seasons at the club. Geoff Stanford was club captain/Wicket-keeper during this period and with both Les and Neil Lenham , Prees , Geal , Thurston and Bazen scoring the bulk of the runs , LMCC would pose a pretty formidable batting line up , and in Coles , Lenham snr , Russell Wood , Thurston and Winter , many opposing sides would collapse in the face of such a well balanced bowling attack. 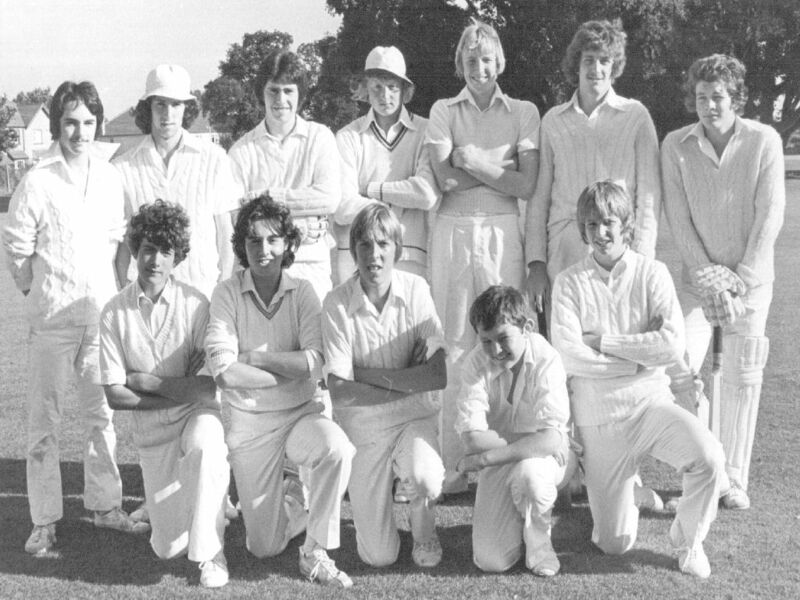 Indeed in the period when LMCC first joined the Brighton Cricket League in 1981 to Les Lenham's last with the club in 1984 , LMCC would lose (out of 62 matches) only 6 times in the League. Winning the league in 1982 and only failing to do so in an unbeaten 1983 season when matches were lost to the weather. LMCC in 1992 came close to another Brighton League Div 1 championship. Having lost only once in their first 10 matches , Manor were to lose their last 2 matches and finish 3rd. The team by this time had lost Coles(again)/Haggis/Eke and Gander , but formed a base around Gary Mason (currently 7000+ runs), Danny Griffin (9000+ runs), Chris Salt (8000+ runs) , Dave Smith (7000+ runs) , Steve Luckhurst (3500+ runs 600+ wkts) and Neil Reynolds (17000+ runs 450+ wkts). A move to a different league brought immediate success in 1995 , having joined the Sussex Championship League , they initially started in Div 2 - this gave opportunity for a potencially successful season - and so it proved. LMCC duly won the league , winning each match they played. Reynolds , Salt and Griffin all averaged over 50 with the bat , and Luckhurst , Jeff Read and Nigel French took 40 wickets between them at an average of 12. Reynolds & Luckhurst also won the respective Div2 batting/bowling trophy's for most runs/wkts. The last 3 seasons have seen LMCC consolidate in Division 1 of a frequently changing League , the league (now the West Sussex League) has seen many changes in the teams represented as clubs try and find the correct level (within a fairly fragile 'pyramid'). The 1998 season saw a continued consolidation for LMCC with regards to success for the 1st XI - finishing 6th out of 17 in the League , with Luckhurst (somehow) winning Division 1's Bowling Cup with 31 wickets. Unfortunately the 2nd XI has been sadly in decline for the last few seasons. Not so much as in the strength of the team , ably led by Jaffa Ullah and the batting skills of John Smyth (career Av of 60 !) , but significantly in the number of players available. From a club able to support 2 XIs on each weekend day (with some thought of a 3rd Sunday XI), the last two years have seen insufficient members for this to be sustained. Indeed only a single Sunday XI has taken the field in the last couple of years-even then sometimes with 10 or even 9 players. 1999 saw much of an improvement on the previous season. Worries regarding the number of players was off-set with the addition of half a dozen regular new players. On the field the 1st XI finished joint 7th in division 1, whilst the 2nd XI, perhaps for to the long term benefit of the team, were relegated to division 3 of the West Sussex League. Sadly 1999 saw the last matches played by Jaffa Ullah after some 30 seasons with the club as he's moved on to a new life in Devon. Sadder news was that of the loss of Bill Winter late in the year. The leading wicket taker for the club with over 1500 wickets spread over 30 seasons, he contributed greatly off the pitch too, with regular maintenance of the pavillion as well as many years as team secretary. 2000 - Saw a greater return on the pitch. The 1st XI finished 4th, with only a last ball defeat at the hands of 3rd placed West Blatchington depriving them of 3rd. Individually, Danny Griffin scored over 1300 runs at 53 with a record 12 fifties and 25 sixes. Dave Baker won the bowling Cup for the 3rd consecutive season, pipping Pete Daly by 1/100th of a run. Neil Reynolds scored 10 fifties in passing 1000 runs. Additionally, Dave Smith, Gary Mason, Nigel French, Jeff Read, Simon Haggis, Chris Salt , Andy Livermore and Steve Luckhurst all contributed to the 1st XI's success. The 2nd XI performed admirably, with a mid-table finished to back up full XI's in all but one of their 15 matches. John Smythe won the Batting Cup for the 4th consecutive season, with 596 runs at 74.5. Henry Nelson supported him well with over 300 runs. The bowling honours were shared, with 5 bowlers taking 12 or more wickets. Gordon Collins won the Bowling Cup for the 5th time, with 12 wickets at 18.9. 2001 - Despite what was to many a quite fragmented season, the results on the pitch were still to be commended in view of the small member base. To finish 5th in the league was excellent and had it not been for a couple of silly results (failing to chase West Blatchingtons' 118 by 8 runs) and for a couple of abandoned matches the 1st XI could have finished 3rd. The 2nd XI, with a much more settled side, finished mid-table in Div 3 and enjoyed their time in due course. The club has even contemplated moving grounds to the vacated Lower Beeding in order to change leagues, improving as a club in playing and reputation as well as being more attractie to new players. But as seems to be the case in recent years, a good idea was not acted upon and we will start 2002 still in the West Sussex League. There is again talk of senior/better players leaving to ry their hand at 'better' clubs as the nucleous of the committee members very rarely sees other club members wishing to offer assitance. Hopefully with the AGM coming in March 2002 there will be one or two volunteers on show. On an individual level, Neil Reynolds won the batting cup for the 6th time, although not since 1995. He scored 1144 runs @ 45 with 4 hundreds & 4 Fifties. Runner-up was Danny Griffin who due to rained off matches fell 26 runs short of 1000 runs for the season. Other notable performances were Nigel French's 269 @ 26.9 and Pete Daly finishing with a batting average of over 30 and a Trophy-Winning bowling haul of 30 wickets @ 12.7. Chris Salt's also averaged in the mid-40's and but for the rain effecting the last couple of weekends could have challenged Neil for the batting cup. Jeff Read, Steve Luckhurst, Dave Baker and Nigel French all had days of success with the ball, but all ended with season averages in the early 20's. The 2nd XI was a familiar story with John Smyth winning the Batting Cup for the 5th year in a row. Jim Kublin's tidy medium pace won him the Bowling Cup for the first time. Chris Dunne was a good addition to the 2nd XI, averaging over 27 with the bat as well as ending up as leading wicket taker. Youngsters came and went and the average age of the team(s) grew year on year. 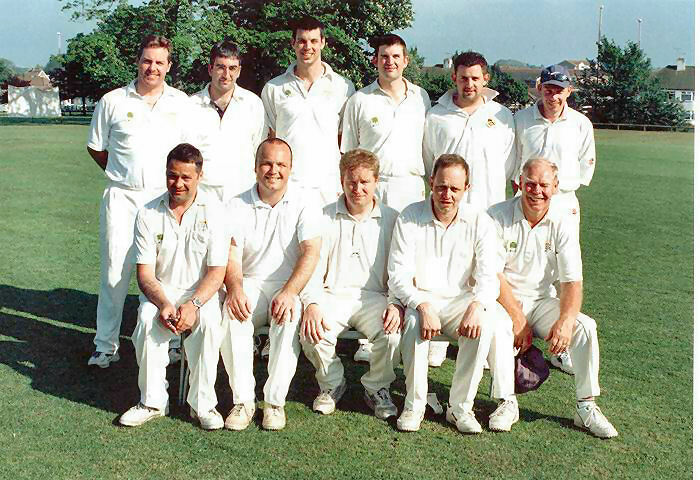 With relegation from Division One of the West Sussex league in 2005 it was clear something needed to be done - it was decided to fold the Saturday 2nd XI, maintaining an XI each day of the weekened where possible. This was a good idea until it was clear that we didn't have enough players willing to play both days of the weekend and so more and more matches began to be cancelled on sundays. Through 2006 it was clear that if we had a Saturday game we couldn't fill a Sunday XI, so a reduced fixture list was compiled. Relegation from Division 2 to 3 followed as the club's core began to shrink, with the likes of Mason, Griffin, Reynolds, Baker, Livermore and Luckhurst perhaps managing circa 10 games a season. Jeff Read's emigration (back) to New Zealand was a massive loss, nearly 500 wickets in 12 seasons will unlikely to be replaced - his leg-spinning exploits will be sadly missed. Reynolds, Griffin, Mason, Baker also featured regularly in the individual honours until 2006 when two new winners emerged - one playing his 20th season, the other, his 1st. Dave Smith's 500 runs @ 32 won his first batting trophy after 20 years of solid play. Wes Sysum stormed into the club as bustling all-rounder, nippy medium pace winning the Bowling cup with 27 wickets to support manic fielding and wristy batting - that also took him to the All-Rounder Cup(!). A tour to Cork followed the 2005 to Munich - the best ever - with Brussels in 2007, Copenhagen 2008, Lisbon 2009 and Malta in 2010. Stiff determination will be the focus to get us out of Division 3 as we have too many good players (on their day) to be in the third tier alongside the various teenage XI's performing for the various 3rd & 4th XI's we'll be facing. At the end of the 2009 season the Committee sat together and planned one last effort to get the club going again. It was proposed - even without the playing numbers - to re-start the 2nd XI and enter them into Division 10 of the League. Through the winter months it was also agreed that we'd attempt to re-start a Colt's Team - of under 11's. To the delight of everyone connected with the club new players emerged, youngsters appeared from nowhere and the 2nd XI played 12 matches in the season only failing by perhaps a couple of wins of promotion. More than 20 youngsters were in the Under 11's squad and altogether some 50 players played for the 1st/2nd XI's during the summer. Disapppointingly perhaps was the 1st XI's relagation to the 5th Division for 2011 - but enthusiasm has returned and word is spreading of the availability of cricket at Lancing if you want it. 2010 also saw after 25 seasons with the Club Chris Salt wiining his first Batting Cup and following both Gary Mason and Dave Smith in the last two seasons in passing 10,000 runs for the club. Here is to an even better 2011 and taking the club forward.